The rapidly changing face of Asian retail is opening up major new opportunities for fresh produce as both large supermarkets and smaller local stores react to the rise of digital shopping. 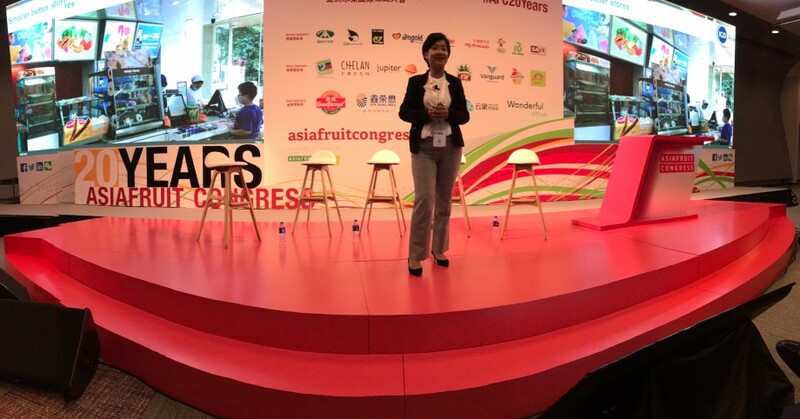 Shirley Zhu, programme director of IGD Singapore, told this week’s Asiafruit Congress in Hong Kong that large chains are reinventing themselves and trialling new technology in the face of strong competition from online retailers and convenience stores. Zhu cited the example of Tesco Lotus in Thailand, which has spent US$1.2 million on a single store to upgrade its fresh food aisles, putting meat, fish and fresh produce together and creating a ‘You Shop We Cook’ concept whereby shoppers can pick out the fresh food they want, which is then cooked into a meal and consumed in store. The retailer is also developing its fresh produce supply chain to give it greater end-to-end visibility. Various supermarkets are trialling aerial conveyor belt systems, whereby consumers can order their shopping via mobile and it will be packed in store and delivered to them within 30 minutes. Digital shelf edges are also becoming more common, while one Asian retailer has even taken the radical step of installing rollercoasters in stores to create interest and theatre. Rollercoasters may not be a panacea, but it is indicative of the lengths major chains are going to in order to attract customers in the internet era. Some companies are fusing technology with tradition, such as online retailer JD.com, which has opened up a physical 7Fresh store in Beijing that is using so-called ‘Magic Mirrors’, whereby consumers can pick up a fruit or a vegetable and a range of information and videos on provenance, sugar content, price etc appears on a screen. It’s not just the big stores that are making changes. Small convenience stores, which still account for a large share of the Asian retail market, are taking orders on messaging service WeChat and packing them for customers. Elsewhere, robots will become more prominent in stores in future, Zhu predicted, freeing up staff for more face-to-face human interactions in the aisle. Her other tips for success included keeping a focus on the needs of shoppers; staying up to date with your customers’ developments; tailoring your offer to different retail formats; paying attention to technological developments; and exploring both online and digital opportunities, particularly given the projected 24 per cent year-on-year growth of online in the next five years.